Multidisciplinary research is a positive shift toward understanding the complexity of human-natural systems. However, combining social science and ecological science methods does not necessarily equate to integration of ideas. Drawing from their urban ecology and environmental anthropology backgrounds, a group of LTER researchers propose using conceptual frameworks that go beyond characterizing social-ecological interactions as stepwise feedbacks, and instead consider simultaneous interactions between environmental variables and human agency (a process they term ‘coproduction’). Urban ecologists constantly experience both the strengths and challenges of drawing from multiple fields of knowledge. The authors state that, “thinking in terms of coproduction is essential for moving beyond the interdisciplinary approach that usually guides urban ecology models, toward a more integrated, trans-disciplinary approach.” In their paper, they exemplify the process of coproduction through a series of figures, including those we highlight here. 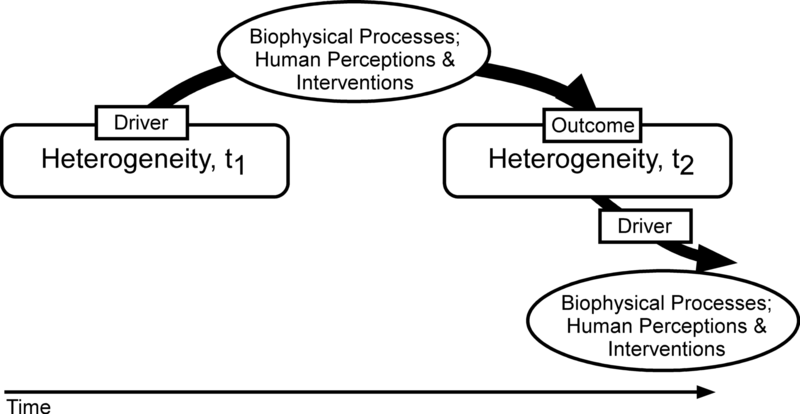 The figure above represents a generalized schema of a social-ecological system that changes across distinctive moments, t1 and t2, in response to biophysical changes and human perceptions and interventions. Biophysical and social events may be simultaneous, and intertwined – i.e., coproduced. To get a sense of what this model looks like in practice, the authors provide an example of changing urban tree cover provided by ash trees before and after a beetle infestation throughout the United States. In the figure below, the patchy distribution of ash trees in urban environments creates an initial pattern of heterogeneity. The iterations that follow are influenced by many threads of biology and human agency interacting simultaneously across space and time, resulting in changing patterns of tree cover and alteration of shade structure and surface temperatures. The authors hope that using a framework based on coproduction will help urban ecologists better understand and describe how human agency and social structure interact with biophysical drivers to create social-ecological change.